Going behind the designs of some of the most popular surfers in the world to see how surfboard art affects an athlete's performance and the judge's score. Five minutes before the 2015 Quiksilver Pro final in Hossegor, France, Gabriel Medina stopped at the shoreline. He knelt down, folded his arms atop his board, and bowed his head in prayer. Any spectator who needed a reminder of Medina’s pre-heat ritual could simply look at the deck of his board. Amid 10 sponsor logo stickers, it featured a painting of Medina in the same pose. The portrait was on all 18 boards he brought to France. “I don’t know if it [the artwork] was lucky but he started surfing better,” Johnny Cabianca, Medina’s shaper, says with a laugh. A few weeks prior to the Billabong Pro at Jeffreys Bay, South Africa, Charles Serrano, Medina’s stepfather, reached out to Cabianca. He wanted to add the portrait—painted by Brazilian artist Nando Martins—to all of Medina’s new boards as a surprise. Cabianca went to work. He printed the portrait on laminate paper, then glassed it underneath the fiberglass and polyurethane resin that coats the boards. Medina loved it. His performance improved. After a disappointing first half on the CT, Medina reeled off 5th, 2nd, and 3rd place finishes. Then he won the Quiksilver Pro France and launched into the title race with two events remaining. He finished third overall. 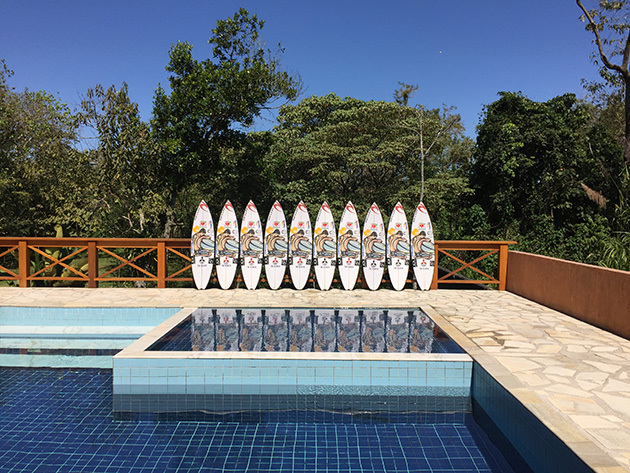 While the designs on Medina’s boards last year were probably the most self-reverential, the only thing that might be as eye-catching on the men’s and women’s World Surf League Championship Tours (WT) as the surfing itself, are the artistic displays on the surfers’ boards. Some louder choices have included cartoon characters, sports cars, expressions of faith, lions, and even rapper Wiz Kalifa. They can also champion causes, like the pink artwork that Julian Wilson has sported on his boards since 2008 at the Quiksilver Pro Gold Coast in Coolangatta, Australia. Wilson’s mother, Nola, is a breast cancer survivor and his inspiration for the pink-themed equipment (Nola also helps design the pink boardshorts that Wilson wears during the contest). In years past, he has auctioned one or two painted boards with the proceeds benefiting the National Breast Cancer Foundation. Still, the hue that received the most attention last year was Mick Fanning’s yellow bottomed boards, especially the one he rode during the final of Billabong Pro at J-Bay, when fought off a shark attack. In the following weeks, Fanning chose to alter the color of his equipment. Instead of the “yum yum yellow” that he previously favored, he switched to blue with black stripes in a variety of patterns—believed to mitigate the risk of an attack. Carl Meyer, specializes in that “stuff.” He’s a researcher at the Hawaii Institute of Marine Biology and does not share Fanning’s optimism about the effectiveness of board color or striped patterns as a shark deterrent. Most pros surfers, though, probably consider aesthetics more than protection when deciding on their board art. The desire for an original look is hardly a new phenomenon. From Gerry Lopez’s “Lightning Bolt” boards, to the clean black outline of Tom Curren’s “Black Beauty,” to Andy Irons’ “Rising Sun,” board art has become intertwined with surfing’s most iconic figures and defined eras. But whereas pro models in snowboarding and skateboarding have signature artwork, surfers and surfboard companies mostly avoid that trend. Industries” label since 1998, decorated both quivers. Surfboards as a whole can be considered art. The intersection was evident in the summer of 2014, when five Haydenshapes boards were displayed in an installation in designer Alexander Wang’s New York City flagship store. Hayden Cox, the founder of Haydenshapes, hand-shaped five of his bestselling “Hypto Krypto” model boards, which were then inlayed with a marble print. But as another year of the CT commences, and with some heats decided by fractions of a point, can artwork on a board extend beyond merely looks and influence performance? As in any art form, there are a variety of mediums: there are resin tints and airbrushes. But one of the most popular options are water-based paint pens, such as Posca Pens, which you apply to a finished board then coat in a light, Krylon clear coat spray to seal the design. “That way I know which one he’s riding when I watch the webcast,” Cabianca says. So whether you’re trying to win heats or make a statement in your local lineup, Brophy insists that all surfboard art should aspire to a simple goal.